• NEST a hammocklike nest of moss and grass, under a conifer bough. This tiny bird is difficult to observe, as it tends to stay high in coniferous trees, often the only clue being its almost inaudible, high pitched song. 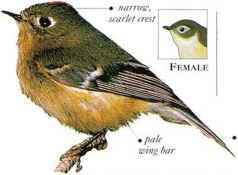 In the fall, northern populations migrate south, and the birds arc more easily seen, hunting insccts in lower cover. 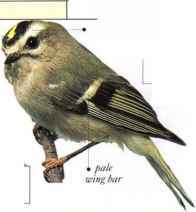 • NliST A deep, feather-lined cup nest of moss and grass, slung below a branch, usually in a conifer. Canada, much of USA, parts of Mexico and Guatemala. Some distribution migration within this range.